I’m so excited about the new Laney’s Kid’s Club (LKC) at Holiday Lanes! Why? Because it’s all new AND it’s our own. For the past few years, we have been affiliated with a national program for our summer free bowling. Don’t get me wrong, the program was great and exposed lots of kids to bowling. It’s just that we didn’t have much control over what we were saying or promoting with the program. We wanted to offer something BIGGER & BETTER to our bowlers and that’s where Laney’s Kid’s Club comes in. LKC is a FREE year-round membership for kids 18 & younger that offers 2 free games bowling every day from May 1 – September 30. Not only is this great for the pocketbook, it’s a fun and fit way to keep kids active. ALSO . . . there is a family pass, a shoe pass and a school employee pass offer that extends the value and gives the rest of the family a chance to bowl with the kids. I love the fact that I work in a job that allows me such creativity and fun. About a month ago, I was just about to sign up with the national program when my boss called and said that we were going to create our own program. I was fortunate that she is connected with other bowling proprietors around the country. My friend and marketing colleague, Rocky from Mel’s Lonestar Lanes, had made a switch last year and designed a program that was working. So I loaded up and headed to Georgetown, TX to pick Rocky’s brain. Let me tell you, Rocky’s got it going on. After my two day visit with her, I was ready to take on the world. A month wasn’t a lot of time to design web sign ups, email marketing and overall promotions, but projects like this get me on a roll. The next thing I did was call an artist friend of mine, Laurie Jarecki, to design our mascot. Laurie was on a train bound for Austin to see Willie Nelson, but within a few minutes on her sketch pad, Pelican Laney was born. After several proofs, Laurie cranked out the final draft of Laney. That’s when Laney took flight at Holiday Lanes. 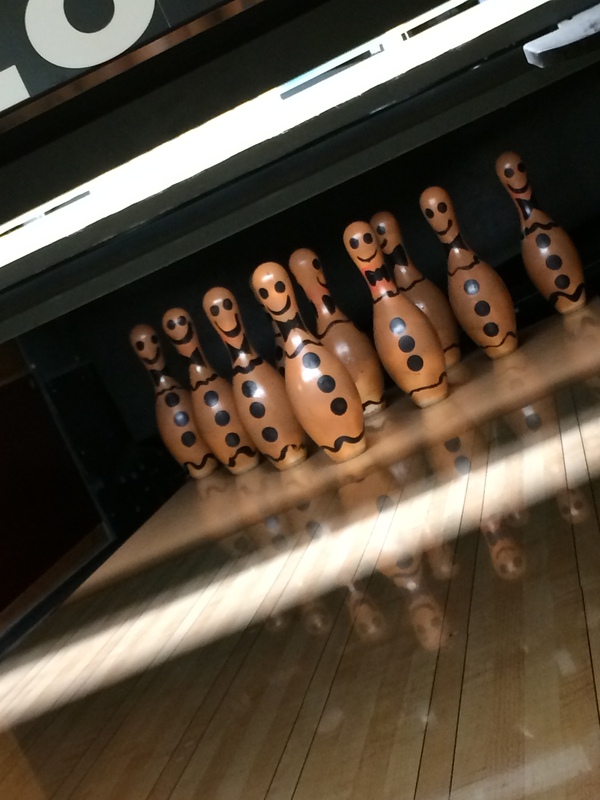 A fun and fit activity – BOWLING is healthy! 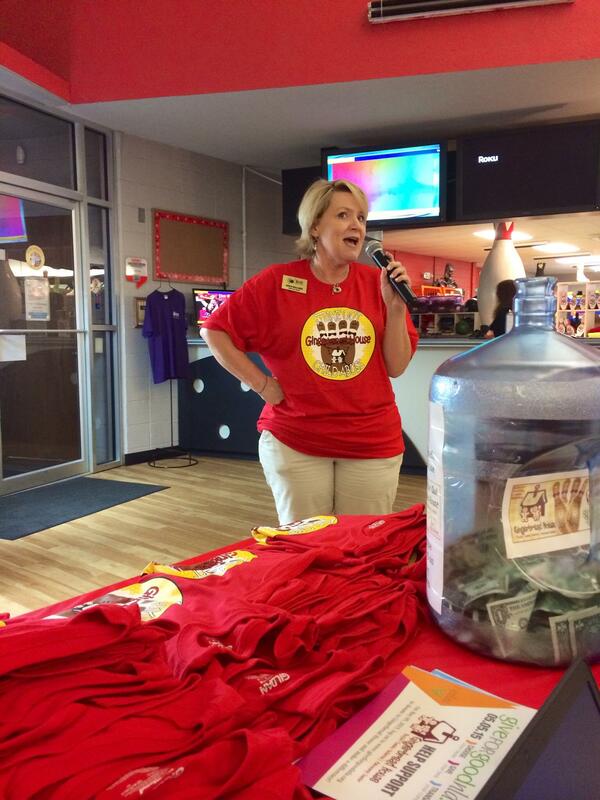 LKC members who book their birthday party at Holiday Lanes will receive a free Laney t-shirt for the birthday child. Bowling builds community. It’s a fit activity (burns lots of calories!) and so much fun. Laughter is guaranteed when you bowl. Our intentions with Laney’s Kid’s Club is to expose as many children to the sport of bowling as a healthy life choice. Holiday Lanes is a great smoke-free environment for adults and kids to play. I really do have the best job ever! I’m so fortunate that I get to share in the goodness of helping others, while promoting Holiday Lanes. Today was The Community Foundation of North Louisiana Give for Good Day. 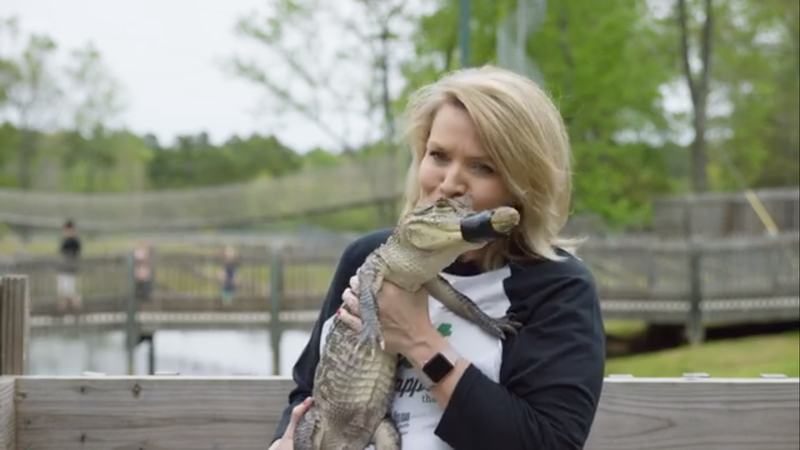 Give for Good day is a 24-hour online giving challenge led by The Community Foundation of North Louisiana to raise unrestricted dollars for the nonprofits in our community. It is a day of giving to celebrate the nonprofits in our community and a chance to raise thousands of dollars to make our community even better. Holiday Lanes was approached by the dynamic duo over at APEX Events and was asked to partner with The Gingerbread House for a Give For Good Event. The Gingerbread House is a 501(c)(3) non-profit organization that works collaboratively with law enforcement, child protective services, medical and mental health professionals to serve child victims of abuse. The “Strike Out Child Abuse: A Give For Good Event Supporting Gingerbread House” was the first partnership between the two. 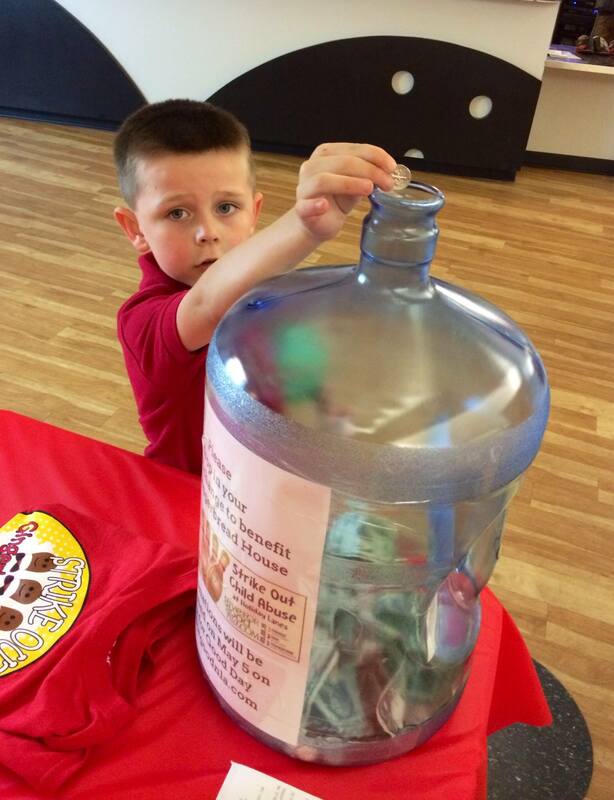 A $10 donation allowed for a try at getting a strike on the Gingerbread lanes. McAlister’s Deli in both Shreveport and Bossier City helped with the cause by collecting donations at their locations all week to add to the total. Barrels were also placed at Holiday Lanes during the week. A total of $667.67 was collected and Holiday Lanes rounded up the donation to make it an even $1000! At the time of this blog, the total showing on the Give For Good Leaderboard for The Gingerbread House was $5635. That’s an awesome way to end the day. One of my pet peeves is when people in Shreveport-Bossier say there’s nothing to do. If you believe that statement then listen up. There’s stuff to do! The Shreveport-Bossier Convention and Tourist Bureau (SBCTB) will be celebrating national travel and tourism week from May 2-10, 2015. 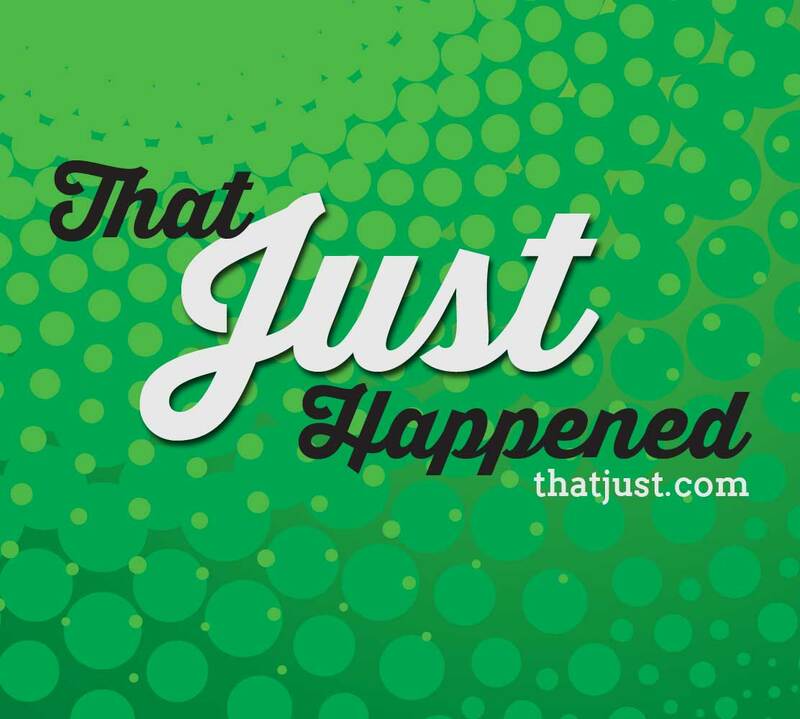 This is an opportunity to share all the good stuff going on in Shreveport-Bossier. Part of the celebration will be the annual P.R.I.D.E. awards to be held on May 7 and will celebrate the outstanding tourism employees in our area. As a previous P.R.I.D.E award recipient, I can tell you that it’s an honor to be recognized for efforts in the tourism industry. The SBCTB is a great resource for not only visitors to our community, but to our local citizens. Have you visited any of the welcome centers? I encourage you to stop by one soon. I promise you will learn something that you didn’t know before about our area. I find something new every time I stop in. I think it’s fun to be a tourist in my own town. 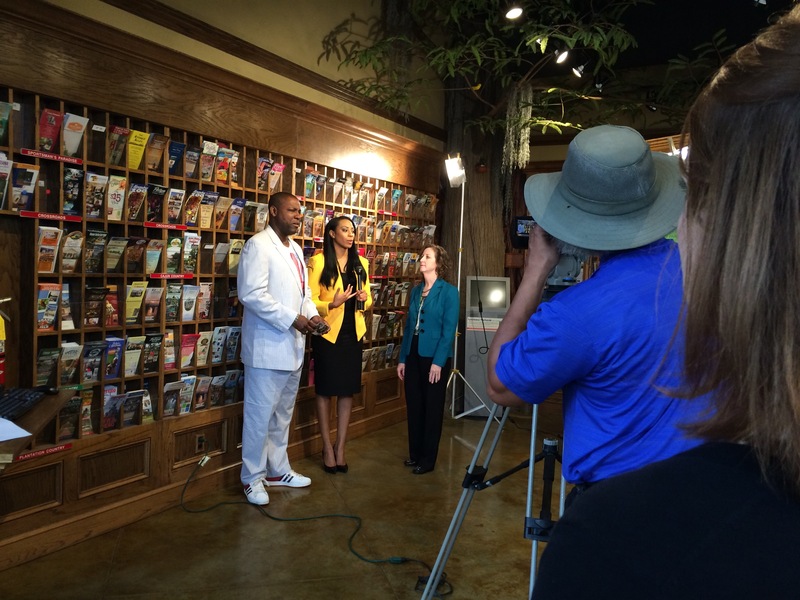 Today I was fortunate enough to be included as a representative of Holiday Lanes in an interview that KTAL will be airing on Wednesday, May 6. I shared the camera with Stacy Brown, the president of SBCTB, and Fred Moss of the Let the Good Times Roll Festival. The festival will be held on June 19-21, 2015. You should check it out. I serve as a board member on the Attractions Association and I can tell you that the resources available to local businesses, such as Holiday Lanes, is extremely beneficial. This SBCTB is absolutely wonderful at encouraging and celebrating Shreveport-Bossier as a tourism destination and local fun hot spot. The message that I want to pass along to you is that whether you live in Shreveport-Bossier, or are a visitor to our community, there is tons to do. 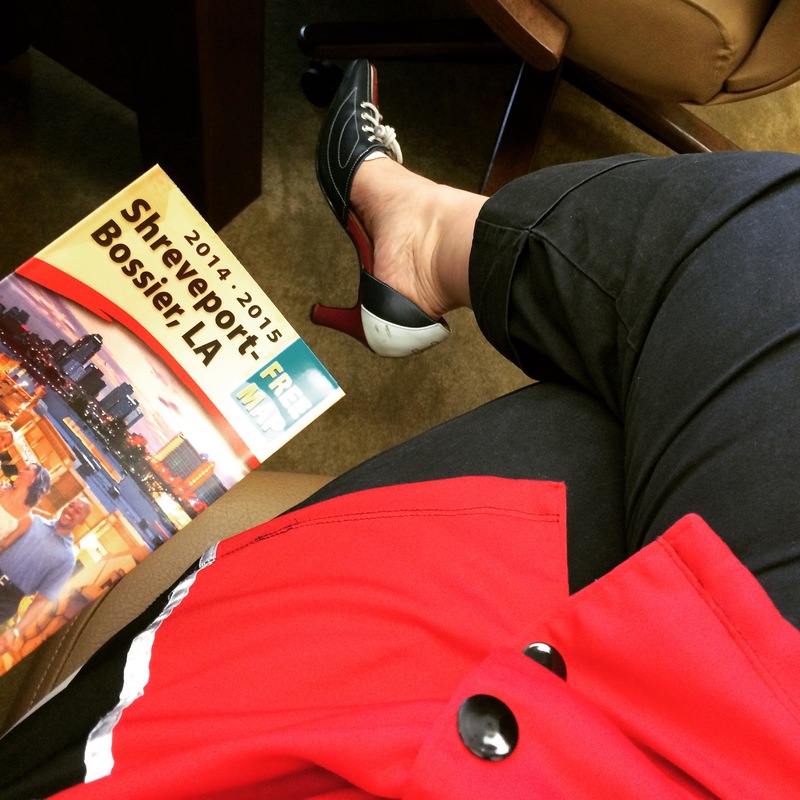 To find out more about the awesome events, festivals, hotels and attractions in our community go to the Shreveport Bossier Fun Guide which lists lots of the fun that you can have. Celebrate the upcoming National Travel and Tourism week by being a tourist in Shreveport-Bossier! I’m honored to represent Holiday Lanes in the December 2011 issue of INTERNATIONAL BOWLING INDUSTRY MAGAZINE. 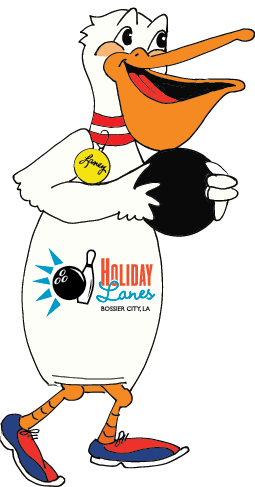 Click on the photo and flip to pages 21 – 26 to read more about my super fun job as Marketing Director for Holiday Lanes in Bossier City, Louisiana. Pink is the new “In” color. It can be seen everywhere, from pink ribbons on the lapels of dainty ladies to pink gloves and tape on rough and tumbling football players. Pink represents a commitment to Breast Cancer Awareness and Education. When Holiday Lanes in Bossier City, LA held a Bowl for the Cure in 2010, we decided to hold a silent auction. Pink items were an obvious choice, but something special would be needed to make the auction unique. After researching thousands of web pages and magazine articles, one idea stood out. In our manager’s office, on a top shelf I had seen a bowing pin that was decorated as Santa. I had also found several websites that had decorated pins into a variety of people and creative art. That was it – Pink Ladies! I thought . . . what if we had a few people decorate bowling pins in honor or memory of someone who had battled breast cancer? Not only decorate a pin, but also write a short synopsis of the person that it was honoring and include a photo. The Pink Lady could be representative of the struggles and survivals of those who have dealt with this disease. What I didn’t know at the time was how therapeutic it might be. I decorated a pin that first year and asked my aunt to provide her story of detection and survival. It became a great way to raise awareness not only to myself, but others who read the story. In that first year, seven Pink Ladies were submitted for the auction and raised $370 for the Northwest Louisiana Susan G Komen for the Cure affiliate. Let me just say, 2011 has become a banner year for Pink Ladies/Pin Art. The Bowl for the Cure auction, which will be held on Saturday, October 15 from 11 am – 2 pm, is still days away and I’m overwhelmed by the imaginative people in our community. As I write this piece, I already have received 38 decorated pins and still have pins coming in daily. When the time came to start promoting the auction, I wasn’t sure that I’d be able to get many to participate. Boy, was I wrong. In fact, Ms. Holoman from the Bossier Parish Schools Talented Program stepped up and got her classes on the project. Participating schools were Carrie Martin Elementary, LA New Tech School at Plain Dealing and Benton High School. The group of very talented students provided 15 pieces of art. The fun thing about it is that no two pins are alike. All are quite unique and each has great style. In addition, the Bossier Arts Council provided six very distinctive pins. It would be wrong of me to point out my favorite, but maybe it’s ok to say my fav is in this group of art. It amazes me to see the creativity and imagination used. I love the pin created by 7th grader, Gavin Jones. His design is called “Hot Stuff”. The pin is dressed in an animal print bikini with a sun hat. He dedicated the pin to his sister and said: “In honor of and as a reminder to my sister, Megan. I love her and want her around for a long time. I want her to be sure to get checked for Breast Cancer”. Megan does not have breast cancer, but her brother wants to make sure she stays that way. What a great brother! Randy didn't let a little rain keep him away. The moments before an event are always the most worrisome, especially on days when the weather is not cooperating. 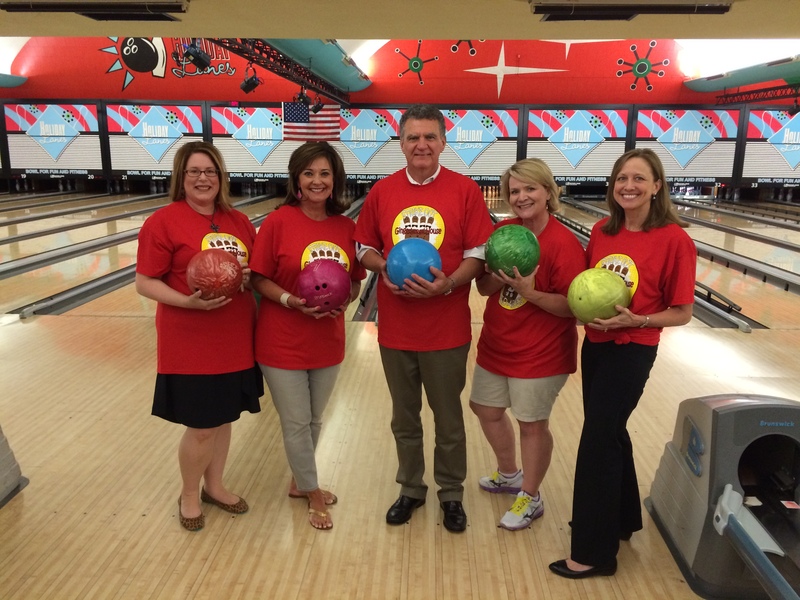 The Bossier Chamber of Commerce After Hours TLA this month was held at Holiday Lanes in the Ten Pin Lounge. Since I was hosting the event, I wondered how many people might actually show up if rain was added to the mix of the crazy wind. I started second guessing everything, including the amount of food to prepare. When I looked at the clock at 5:08, I was no longer worried. By the end of the evening 70+ people had fared the blustery and rainy weather for the chance to network with other members and have a little fun. If you will notice, click the picture above – Randy was soaked to the bone. Door Prizes are always a fun time! I am a little partial since this is my place of employment, but let me say, I heard more than one person saying this was the “funnest” TLA they’ve been to. We had darts, music, adult beverages, food from the Striker’s Cafe, door prizes and of course Bowling. Holiday Lanes is a great place to gather with friends, family and co-workers. It’s the perfect place to throw a party! 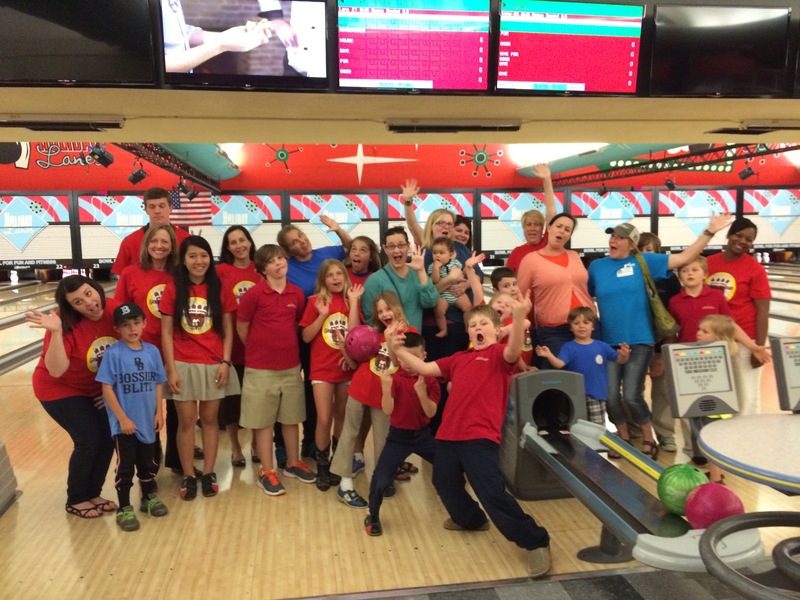 Whether you’re planning a corporate outing, a birthday party, a church get-together or family reunion, you’re going to have a great time at Holiday Lanes. Not only can we help you have fun bowling, we can also furnish wonderful food and beverages for your group. I’m really excited about scheduling some “Play Therapy” team building sessions. I haven’t had the pleasure of facilitating an event, but am looking forward to it. Have you heard about it? A typical “Play Therapy” session includes 90 minutes to 2 hours of play — bowling, billiards or arcade — a facilitator and awards. We can also include food for your group if you choose to have lunch with us. You will see new leaders emerge and witness your co-workers cooperating with great teamwork as they compete against each other. To paraphrase Plato, you will learn more about your co-workers in one hour of play than you will in a lifetime of conversation. Build teamwork, create recognition, exercise, reduce stress and have fun! Thanks again to everyone who came out tonight and helped reduce my worries. 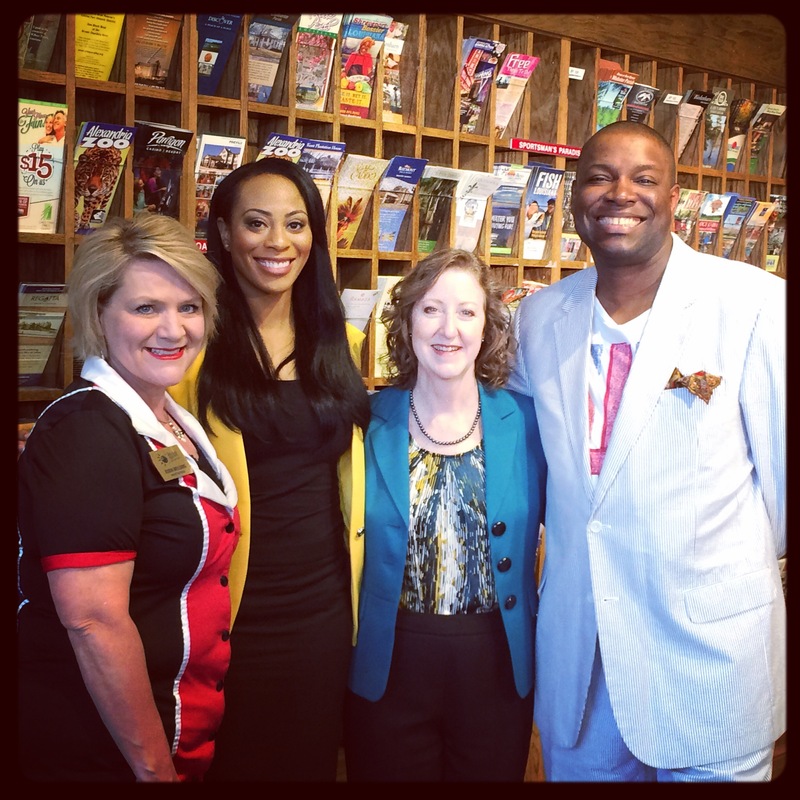 It really was a fun evening and I look forward to attending the next Bossier Chamber of Commerce event. If you haven’t joined the Chamber, you are missing out on lots of networking – call 746-0252 to get more details about becoming a member.